A Thought: Making the Most of It! Savannah not only has beautiful and historical sights, it also has a few quirky aspects to it which the guides graciously pointed out to us. For instance, most of us have gutters and downspouts attached to our homes to carry the rainwater away from our homes. 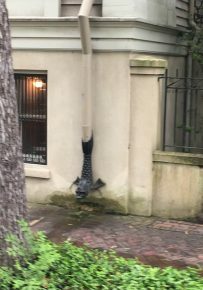 But, I’m not sure I’ve ever seen a ‘decorative’ downspout! The homeowner obviously chose to ‘make the most of its purpose.’ God created us to be unique, not boring in our purpose. How will you creatively respond to God’s purpose for you today? Have fun! Don’t whine! Be alive! Happy Tuesday!